ATLANTA, GEORGIA, UNITED STATES, February 2, 2019 /EINPresswire.com/ — Sunday’s big game comes with big attention on security. With a footprint well beyond Mercedes-Benz Stadium and spanning 10-days with a draw of nearly 1 million fans, security is an ever more complicated scenario. An increased focus on preventing hostile vehicle encroachment has added Meridian’s Archer 1200 barriers to the security mix. Det. Chief Scott Kreher recently advised a local Atlanta news station that his department has been working on the security plan for two years. To provide a perspective on the magnitude of the project, the Department of Homeland Security has designated the Super Bowl as a SEAR (Special Events Assessment Rating) Level 1 event. This is superseded only by NSSE (National Special Security Events) events like the State of the Union Address. Meridian’s Archer 1200 vehicle barrier was most recently deployed at the Rose Parade and Game, another SEAR-1 event, and is a certified solution meeting both U.S. and European standards of protection. Twenty-four Meridian barriers will be in use at the Super Bowl compound. As events progress toward game day, the barriers will be repositioned to protect critical areas. Ease of deployment and a modular approach means the Archer 1200 barrier has the most flexibility of any product in the marketplace. Unlike fixed or oversized solutions, the Archer 1200 can be moved to respond to changing threat conditions. Another important feature is the ability to allow access to emergency vehicles and free pedestrian flow – which can be critical in the event of an evacuation. Super Bowl LIII is not the only NFL location to employ the Archer 1200 barrier. 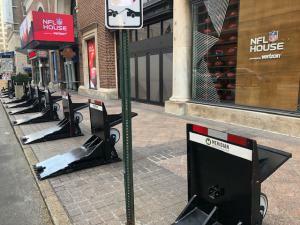 During the 2018-19 season, Meridian barriers have been used by the Cincinnati Bengals, Baltimore Ravens, Charlotte Panthers and Jacksonville Jaguars. NFL teams also appreciate that the Archer 1200 is a formidable barrier that does not compromise the aesthetic principles of the public space. With no risk of being overlooked, barriers at Cincinnati’s Paul Brown Stadium are proudly painted Bengal orange. For more information about Meridian Rapid Defense Group (a Pasadena, CA-based company) or the Archer 1200 Vehicle Barrier, visit www.betterbarriers.com.